If you are looking for a bridal makeup artist in Delhi to do your makeup and hair on your big day, then you have landed just at the right place. Below is a curated list of the best bridal makeup artists in Delhi who can do your bridal makeup and hairstyle at affordable prices. You know what that means, right? You get to look like the bride of your dreams without having to shell out a fortune or sell a kidney! Read on, and tell us which bridal makeup artist in Delhi NCR did you find the most suitable for your D-day! Simple, bold or glamorous, whatever be your requirement for the perfect bridal look, Derma Conscience By Arnavi will fulfil it. This bridal makeup artist in Delhi has packages starting from Rs. 12,000. Right from HD bridal makeup to airbrush makeup, you can lay your hands on any bridal makeup package at this makeup artist in Delhi. Makeup By Vanya Arora bridal makeup charges start at Rs. 15,000. Specialising in airbrush bridal makeup, Magic Dust By Anukriti is the ideal bridal makeup artist in Delhi to hire for your wedding or pre-wedding functions like mehndi, sangeet or cocktail party. Bridal makeup packages start at Rs. 15,000.
Who doesn’t love a flawless makeup base with beautiful eye make that makes the bridal look stand out, right? Ruchika Bhatia Makeup Artist is the bridal makeup artist in Delhi who will give you just that! Her bridal makeup packages start at Rs. 15,000. Simple and understated or bold and daring; whatever kind of bridal look you want to achieve, Makeup By Maanavi will help you look like the fairytale princess you always dreamed of looking like on your big day. Her bridal makeup package prices start at Rs. 15,000. Be it subtle or bold, Makeup By Zayna is that makeup artist in Delhi whom you can trust to give you the dream bridal look on your big day. Her bridal package prices start at Rs. 12,000. There is no other bride who looks more radiant than the one who has a makeup that goes perfectly with her entire wedding outfit. If you too wish to look like a complete diva on your big day, then The Colour Palette By Yashika is a bridal makeup artist in Delhi you can definitely hire. Her package prices start at Rs. 10,000. There is no bride who hasn’t dreamt of looking like a royal princess on her big day. While your wedding outfit plays a major part in your bridal look, you shouldn’t forget that a makeup well done brings the entire look together. Book Surbhi is your bridal makeup artist in Delhi for your wedding with packages that start from Rs. 18,000. SHEEN - Makeup By Sheeny Kaul is a fantastic bridal makeup artist in Delhi NCR that can help you look like the bride you always dreamt of looking. You can book her bridal makeup packages that start from Rs. 18,000. Doesn’t this bridal makeup look absolutely ethereal? Well, you too can get a bridal makeup like this in Delhi NCR by hiring Pintura Makeup Studio by Mansi Narula, who is a skilled MUA and specialises in everything from HD bridal makeup to airbrush makeup! Her bridal makeup packages start at Rs. 15,000. 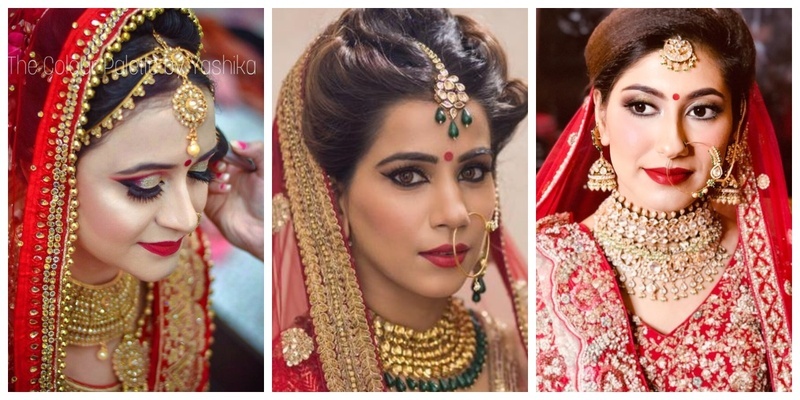 So, which of these makeup artists in Delhi are you considering to book for your big day?